Stainless steel is one of the most durable and modern finishes that you can find in a kitchen. It is also one of the most expensive. Refinishing appliances professionally can cost hundreds of dollars. The great news is, you don't have to spend a fortune to DIY this upgrade. Stainless steel paint is only one of the new innovations on the market that will help you update your look without breaking the bank. What Is Stainless Steel Paint? Ranges and dishwashers pump out a lot of heat and moisture, which isn't ideal for traditional paint. The high-gloss finish of your kitchen appliances doesn't lend itself well to oil or water-based paint, either. Stainless steel paint provides homeowners with the best of both—a high-end finish, easy application and maintenance. Make sure that you purchase the right paint for the job. Look for liquid stainless steel, which includes some larger light-reflecting pieces within the paint that give it an authentic look, feel, and luster. Spray-on stainless steel paint and "stove paint" are not ideal to coat your appliances and expect them to look good for long. If you’re looking for a temporary finish, you can find it online. It is usually less than $30 for enough paint to cover your range or dishwasher. Note: Stainless steel is a type of finish, not a specific color. If you're trying to match upgraded appliances to some that you already have, keep at least five feet between them to limit comparisons between the two hues. Look for a heat-resistant panel to paint and place on the wall between your range and vent hood. Or, paint tile backsplash panels to install around countertops. Make your outdated vent hood look like new. Consider painting your cabinets white or another solid color for a high-design upgrade. Spray products can help you paint the nooks and crannies of a faucet without leaving beads of excess or unpainted patches. Make sure that you don’t apply this in areas exposed to extreme heat. Apply it to the surfaces facing the living area or paint your poker set. Whether you paint just the legs, the seat or both, this can be a chic update. There are rust-resistant stainless steel paints that are perfect for outdoor use. Note: Liquid stainless steel is only good for up to 300 degrees Fahrenheit. Don’t use this anywhere with higher temperatures. Avoid applying this product to grills, drywall, and any submersible surfaces. Prime or lightly sand any plastic panels to give the paint a base to stick to. Assure that the panels are ready by checking them with a magnet. If the magnet sticks well, then you're ready to move on to the next step. Apply up to 3 light layers of stainless steel paint to see the true color begin to come through. Keep each layer thin to reduce the possibility of drips or globs in your paint. Use the included foam brush to drag through the paint and create the stainless steel look. Allow the paint to fully dry according to the instructions. Add up to 3 layers of clear topcoat to seal the project. Do not scrub or put magnets on the surface for at least 2 weeks to let it cure. Stainless steel paint is relatively durable. You may notice the color become more bronze near a stovetop after years of exposure to the heat. This is nothing to be concerned about unless the discoloration bothers you. Traditional stainless steel appliances are also likely to do this over time. Automotive grade resin can be scratched. There is the possibility of staining if something is left on the paint for a long time. In general, the paint is very durable with normal use. 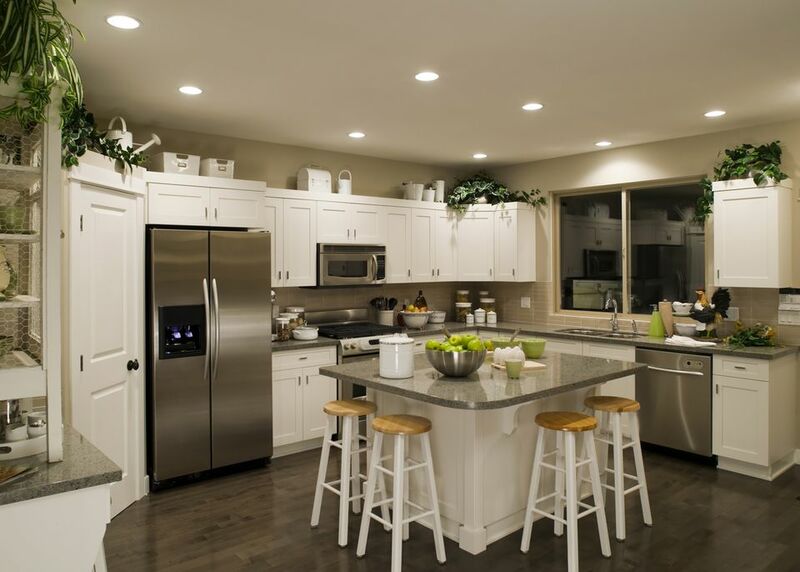 Maintenance of the painted stainless steel appliances is simple. No scrubbing required. You can wipe the surfaces clean with a simple cloth and warm, soapy water. Follow cleansing with a water rinse and buff the surface dry with a dry, dust-free towel. Fingerprints wipe away easily if you add two to three layers of gloss on top. Do not scrub vigorously or add magnets to the appliances for a minimum of 14 days. This allows the finish to dry thoroughly and cure to a solid and even hardness.